Bardia Kimiavi dribbles the ball. The freshman forward played 79 minutes Wednesday. Overtime has the been the defining characteristic of Northwestern’s season. Entering Wednesday, the Wildcats had played eight overtimes games — losing two, tying five and winning one. In its final game of the Big Ten slate, NU (4-9-5, 0-6-3 Big Ten) once again went to extra time and once again was unable to pull out the victory, losing to Wisconsin, 2-1, in double overtime. The Cats have now not won a game in over 45 days and have failed to win a Big Ten game for the first time since 2003. The Badgers (8-5-2, 5-2) scored the game-winner just over two minutes into the second overtime. Noah Melick received a long ball from Zach Klancnik, outmuscled senior defender Jake Roberge to gain control and finessed a lovely shot in to the upper left quadrant of the goal. 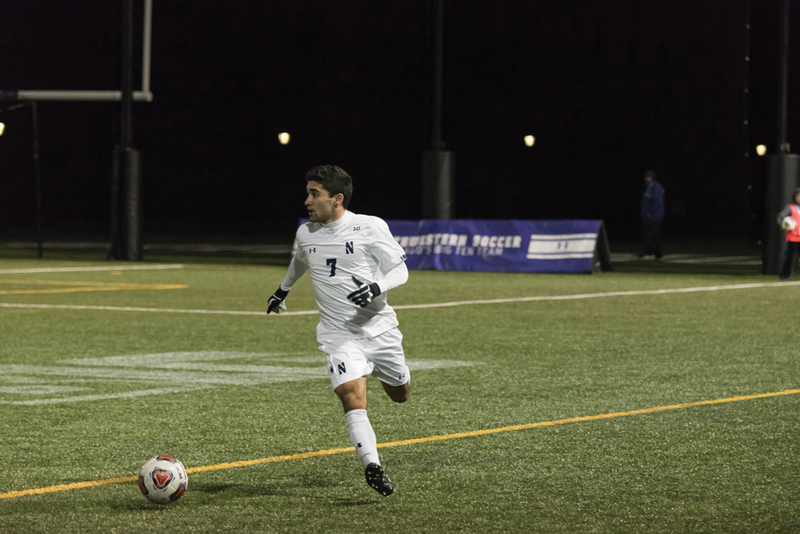 NU got on the scoreboard first in the second half via the left foot of freshman forward Jose Del Valle. Senior midfielder Camden Buescher played a cross into the box from the right side of the pitch that was not able to find freshman forward Bardia Kimiavi. Junior midfielder Sean Lynch ran the ball down and played a simple ball to Del Valle, who received the ball just outside the 18-yard box. Del Valle caught the pass with his right foot, evaded a defender with a crossover to his left, took a touch and shot it low and to the left of goalkeeper Dean Cowdroy to give NU the lead. It is his first goal of the season. After Del Valle’s goal, the Badgers ramped up the offensive and continually found their way into the final third. With 11 minutes left in the half, Isaac Schlenker redirected a corner kick towards the far post, but Kimiavi was covering the spot and cleared the ball off the goal line. Less than three minutes later, Mitch Guitar received a throw in down the right flank and made a run towards net and took a shot towards sophomore goalkeeper Miha Miskovic — who made a strong save to push the back out into the field of play, where freshman midfielder Connor McCabe settled the ball and cleared it. But Wisconsin would not stay goalless for long. Alex Alfaro dribbled past graduate defender John Moderwell and played a slow low cross into the box. Andrew Akindele one-timed a curler that got past Miskovic but hit the right post. But the ball deflected right into the path of Schlenker, who slotted the equalizer home. Lynch said losing so many overtime games is starting to weigh on the team.